There are moments that create collective goose bumps – and the past action weekend held some of them in store. When we gather in thousands at sunrise to go into action together. When we overcome the police’s attempts to stop us, defy police lines and water cannons, and finally realize that we are so many, we are impossible to evict. When, after a night on the rails of the coal railway at the end of October, we come together happily, empowered and full of energy at the camp and the air is filled with: Something great emerges right now. 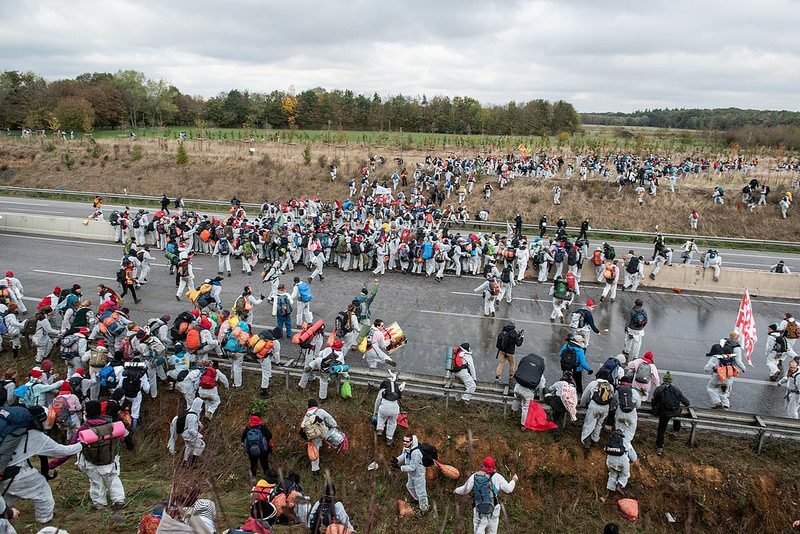 The action was the biggest Ende Gelände action ever. 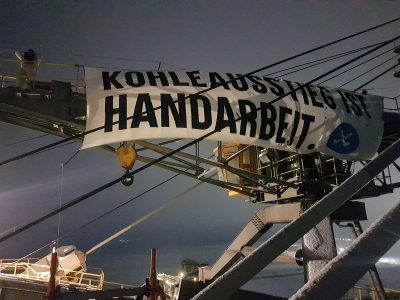 Over 6,000 people, many of them from other European countries, came together and blocked dirty coal infrastructure in the Rhineland for over 24 hours. Neither the attempts of politicians and police to criminalize our protest, to prevent the camp or to make the journey more difficult, nor the cool October nights could break our determination. 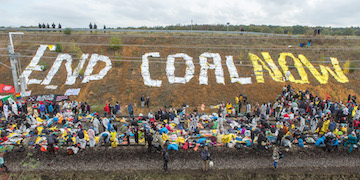 Together we have shown: the coal exit cannot be stopped – we come back until the last excavator stands still! 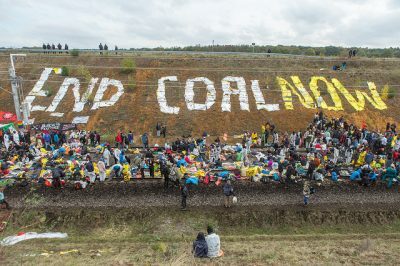 Meanwhile, more and more people are organising and building up local groups [https://www.ende-gelaende.org/en/get-involved/local-groups/] to work for climate justice and a good life for all in the long term. Strategy conference of the Climate Justice Movement: documentation and how do we proceed? Our actions were predominantly positively received by the press. We could show that it is not only about the Hambach forest, but about the immediate coal exit and climate justice. A brief overview of the German and international press review can be found here. and the video you can find at the start page. Also this year, one side of Ende Gelände was that of repression: Already in the forefront the police hindered us to find a suitable camp area and the first camp set up in Manheim was even evicted. The people from the special train were completely kettled, searched and controlled on arrival. After the action began, the orange finger and a seat blockade were completely taken into custody and sometimes had to wait for hours without toilets in buses. The people who did not want to leave the tracks voluntarily on Sunday were sometimes brutally evicted, but the prisoner trains were stopped by a climbing and a lock-on action. On Monday, the last EG activists were released after detention reviews. 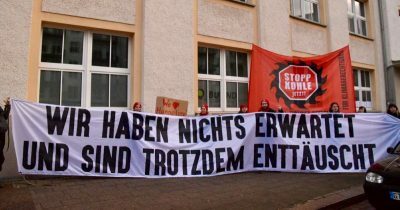 There are currently two trial dates against Hambi activists who were active during evictions in the Hambach forest in spring. We invite everyone to the come to the district court in Düren on 12 and 20 November at 9 am in order to show solidarity with those affected. Because it usually hits individuals – but they meant all of us! 3. Review and outlook – get active! An eventful time lies behind us. On the climate camps new contacts were made and common actions with our European friends in the Czech Republic and the Netherlands were accomplished. 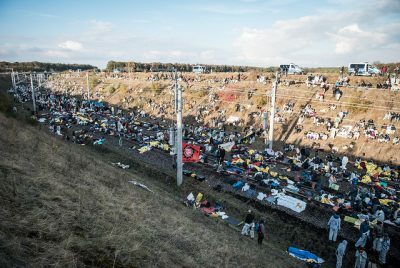 In the course of the eviction, a new structure developed spontaneously with the group platform, which put a further Ende Gelände field action on its feet within a very short time. And also the passing on of knowledge and the necessary skills was somehow managed. Not only did we experience the biggest action so far, but we were also able to give new people access to the alliance. The climate justice movement has succeeded in preventing further deforestation, a great success. And even if it was “only” a court judgement; the movement set the accents and created the social climate, which finally led to the (provisional) clearing stop. if you don’t have one in the area yet: start one! If you need support, please contact us! At the beginning of next year there will be a big Ende Gelände meeting where new plans will be decided and newcomers are very welcome. More information in the upcoming newsletter. From 30 November to 2 December the evaluation meeting of the Ende Gelände action 2018 will take place at Bonn. Here we want to evaluate the very special last year with all, which were involved in the working groups, local groups or otherwise in the preparation of Ende Gelände. If you already know that you want to join, please remember to register here. 4. Strategy conference of the Climate Justice Movement: documentation and how do we proceed? Many of you were at the strategy conference, which took place from 17 to 19 August at the Climate Camp in the Rhineland. There, very different groups came together, among others newly founded players, who want to become active against automobile companies, air traffic and industrial agriculture. The preparatory team has now produced a documentation of the exciting discussions, including a reader with the strategy papers submitted by various climate groups at the time. Due to the eventful last weeks it took a little longer. 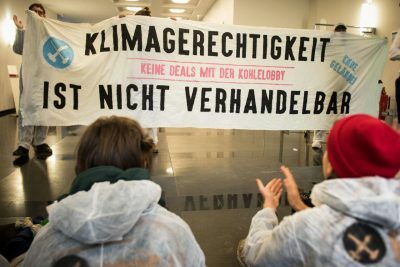 With this we would like to conclude the strategy conference of the climate camp in the Rhineland and look forward with anticipation and numerous thoughts and ideas to the action conference from 11 to 13 January (at Kassel). But here we still need some preparation, i.e. if you are interested, please write an email to: strategie2019@riseup.net.